In my house, I always stress the importance of eating veggies. I do this all the time to the girls, without trying to be annoying of course. Why? Because it is healthy for you and it helps you POOP! The girls have bought into this belief and blame lack of veggies for any bad poops they have. These days, more often than not, they ask for veggies to make sure they are eating veggies everyday! Even if they don’t enjoy the veggies I cook that day, they will still eat it because they need it. Sometimes I gotta nudge them a bit to eat it, but they will eat it. Chrysanthemum soup is the perfect soup for bright green veggies. I’ve been making this for the girls since they were babies. The soup is healthy, nutritious, and a great way to ensure the kids get their veggies. It is also tastes uniquely herbaceous and smells fantastic. 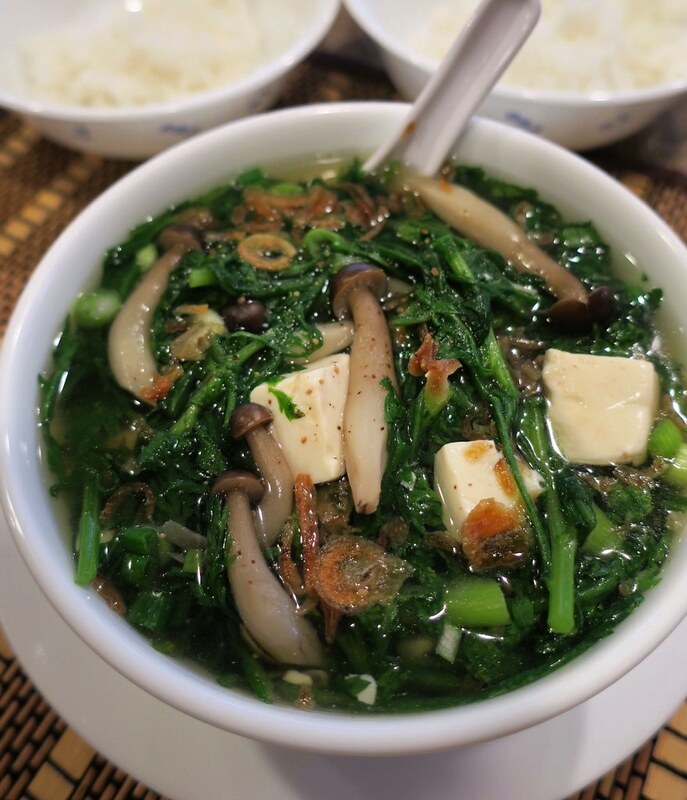 The girls love mushrooms and tofu, so they always enjoy eating this soup with rice. 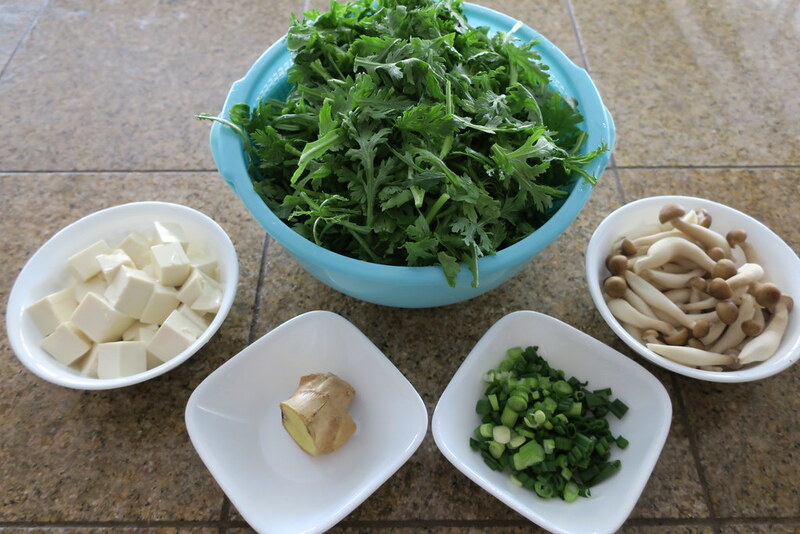 Enhance broth – Combine vegetable broth, water, salt, mushrooms, and ginger in a medium pot and bring to a boil. Lower heat and simmer for about thirty minutes on medium low. Make Soup – Bring the pot back to a hard boil. Add chrysanthemum leaves into the medium pot. After a minute, gently stir in silken tofu. Turn off heat and gently stir in half of the green onions. Prepare Bowl – Scoop soup into a large bowl. Top with fried onions, remaining green onions, and black pepper. If you do not have beech mushrooms available, enoki, button, or straw mushrooms are perfect substitutes.